This is the hashtag that thousands of people in Estonia and around Europe have been adding to their social media postings in the last few months. I’m glad to add it to my blog, too. Who is Eston Kohver? 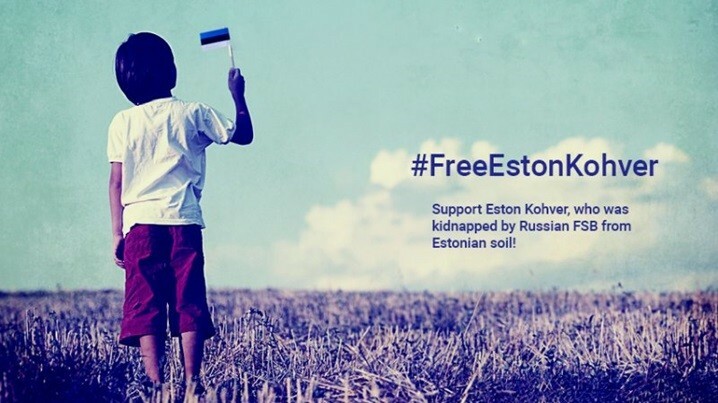 He’s an Estonian security services officer, who was abducted from Estonia on 5 September last year, and has been detained illegally ever since by the Russian authorities. This was the same day as the Wales NATO summit and two days after US President Barack Obama made a landmark visit to Tallinn, the capital of Estonia, and declared that the defence of Tallinn is just as important to NATO as the defence of Berlin, Paris and London. The main Russian news channels report that the FSB made the arrest; what they dispute is that it was in Estonia. Our Estonian allies are clear that it was. What did he do? The Estonian government says Kohver was in the heavily forested border area as he was engaged in uncovering a counter-cross border cigarette smuggling operation. Russia says he was spying. We know that a great quantity of illicit cigarettes come into the EU from Russia, so the Estonian version is plausible. An abduction across international borders is illegal, and needs to be condemned. The timing of his seizure also gave it great political significance – all involved in the operation (and there is no way in the FSB that such an operation could be conducted without high level clearance) will have known that it sent a threatening message to Russia’s neighbours. Russia has also sent a signal that any trial in circumstances such as these won’t be conducted in a fair and open way. The trials and sentences given on 25 August to Oleg Sentsov and Oleksandr Kolchenko are further evidence of this. Kohver’s trial was conducted without the Estonian consul being allowed to be present. He pleaded not guilty to the charges of smuggling, espionage, illegally carrying arms and illegally crossing the border – the last especially laughable. But on 19 August he was sentenced to 15 years in a labour camp. It is essential that the UK and our partners continue to support Estonia and maintain solidarity and deterrence through the EU and NATO. Eston Kohver’s abduction, detention, and sentence are illegal and Russia must respect international law. I have raised his case several times now with the Russian ambassador in London, pressing for his release and his return to his family, and will continue to do so. Our embassy in Moscow will continue to monitor his welfare and the UK will continue to support international action on his case. The article was first published on the Foreign & Commonwealth Office blog. The opinions in this article are those of the author. David Lidington is a British Conservative Party politician, who has been Member of Parliament for Aylesbury since 1992. He is currently a Minister of State at the Foreign Office, serving as Minister for Europe.